Mayor John Tory received a huge vote of confidence Monday, receiving 63.5 per cent of the vote in Toronto’s municipal election, eclipsing the next most popular candidate by more than two-to-one. On one hand, this can be interpreted as an endorsement of the status quo. However, Tory campaigned on a series of new promises including creating 40,000 “affordable” rental units over 12 years. 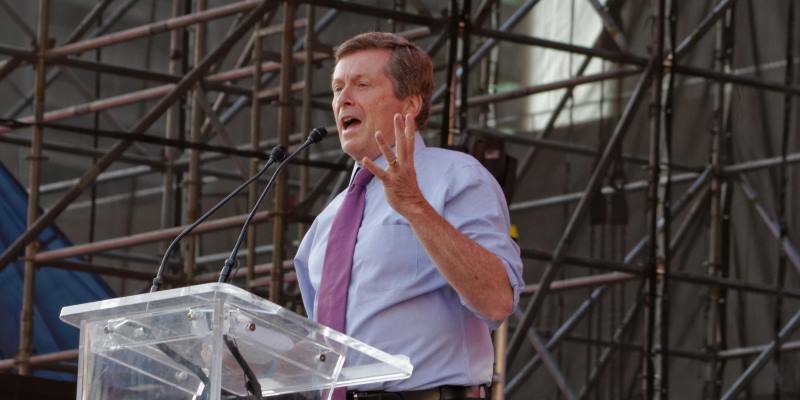 Tory provided scant information on how to deliver on this promise, but it appears he intends to ramp up the city’s existing Open Doors program, where city hall offers incentives (such as property tax relief and fast-tracked permit approvals) to private and non-profit developers providing below-market rental and ownership housing. The program’s intentions are laudable, but it would have to more than triple its original annual output of units to meet Tory’s 40,000 target. So what else can the mayor and council do? For starters, fast-track all types of housing—large units, small units, ownership and rental. Why? Because the only way to reduce “market rate” housing costs in a desirable city such as Toronto is to build more housing. A lot more. According to Fraser Institute research on the building permit approvals process across Greater Golden Horseshoe municipalities, it takes one-and-a-half years (on average) before builders can break ground in Toronto. This process is also strewn with uncertainty and high regulatory costs, reaching almost $47,000 per unit in 2016. All of these factors, combined with local opposition to new homes, deter the many new housing units needed for demand to keep pace with supply. On the rental front, Toronto can only deliver once city hall has a better grasp of the economics of rental development. According to research commissioned by the Canada Housing and Mortgage Corporation (CMHC), returns on rental development are negative or negligible in most of Canada’s large cities due to high land costs, high property taxes and high sales taxes relative to rental income. By reducing these barriers (e.g. cutting the disproportionately high property tax rate on apartment buildings and relaxing zoning restrictions on additional rental density) city hall can start addressing the severe lack of rental vacancy in Toronto. Armed with a clear mandate and fresh ideas, Mayor Tory has the political greenlight he needs to address Toronto’s most pressing problems. On the housing front, Tory and his new council can deliver by reducing barriers to the many new homes current and aspiring Torontonians desperately need.